You’ve worked; you’ve planned; you’ve mapped out every detail in order to ensure that your wedding day is not only memorable, but magically perfect. Of course, any bride will agree that the closer you get to the big day, the more stressful the situation becomes. It’s a simple formula: The more stressed you are, the more likely you are to breakout. Therefore, one of the best ways to ensure that your skin looks great on your wedding day is to lower your overall stress level. Of course, any bride-to-be is likely to laugh at this suggestion, as it is far easier said than done. While you can’t make those final dress fittings go away, you can tackle stress from a physical angle. Try to squeeze in a few yoga classes or a soothing weekly massage in the weeks leading up to your wedding. No time for those ideas? Then try long baths or some simple deep-breathing exercises at home. By doing your best to reduce stress from a physical standpoint, your mind will eventually start to catch up. With limited time at your disposal in the weeks leading up to your wedding, it’s easy to sacrifice proper nutrition in favor of fast food and stress-induced snacking. However, you might be doing your skin a disservice by giving in to poor eating habits. Because the more oil you consume, the more oily your skin is likely to get. If a general lack of time is a factor, then consider going to the supermarket and treating yourself to items such as bagged salads, cooked lean meats, and wholesome sides. As a bride-to-be, nobody expects you to spend hours slaving over the stove in the weeks leading up your wedding, but there are ways to keep your diet in check so that your skin stays healthy in time for the big day. The more water you drink, the better your skin is likely to look. While many soon-to-be brides might be more tempted by caffeine or even alcohol during this hectic time, you should make an effort to incorporate more water into your daily routine. Another benefit to drinking more water: It won’t cause you to put on any unwanted pre-wedding pounds. With so much to do and such little time, sleep can be a precious commodity for some brides-to-be. However, if your wedding day is rapidly approaching, then you’ll want to start making sleep a priority. A lack of sleep can lead to dull or problematic skin, so be sure to stay well-rested during the weeks leading up to the wedding. While you don’t need to go overboard on medical spa treatments in preparation for the big day, it’s a good idea to schedule a deep cleaning facial about one month prior to your wedding. 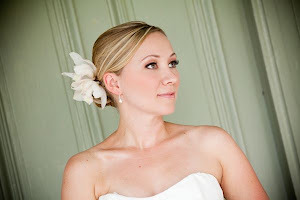 A good medical spa will offer instructions as to how to treat and maintain your skin following the facial so that by the time your wedding day rolls around, you’ll be looking as beautiful as you ever could have imagined. Getting married is something that you will (hopefully) only get to do once in your life, so you’ll want to do your part to ensure that your skin is ready for the occasion. However, as significant as your wedding day is bound to be, don’t forget that it’s also supposed to be fun. If you keep telling yourself that your big day is going to be perfect no matter what, then chances are, it will be just that. And the more positive you are, the more likely your skin is to cooperate.